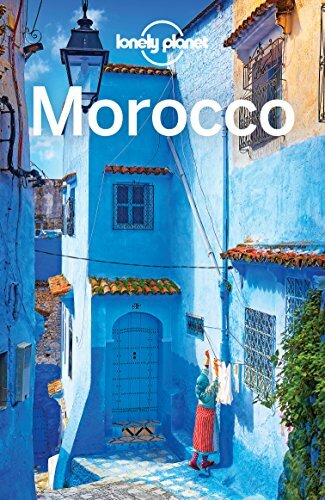 Bordering both the Atlantic Ocean and the Mediterranean, the North African country of Morocco typically attracts visitors for its 3,600 km of sun-drenched coastline. But with a rich history and diverse range of cultural influences many people travel to visit its cultural cities too. 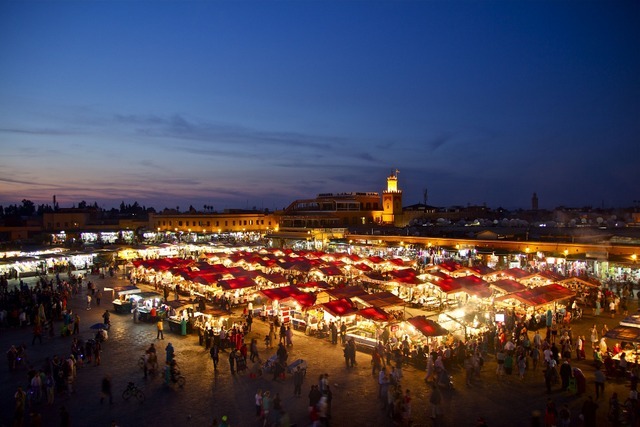 The souks of Marrakech should definitely be on your agenda, whether you plan to splash some cash or not. These markets are high impact; expect a kaleidoscope of colours, a plethora of scents, and so much activity that your head is at risk of spinning. Here you’ll find all manner of goods from unusual, exquisite jewelry to fragrant herbs, spices and incense; quality silk scarves, colourful textiles, leather goods and pottery are all in abundance here. Be prepared to barter too; they’ll think you’re mad if you don’t, and you’ll pay well over what you should. Shopping here is a bit of a game, and it can be quite fun. Remember when shopping in Marrakech that boldness is rewarded! Your attention will be demanded from every angle, with traders doing everything they can to coerce you into their shops. A wander around the souks is an interesting lesson in assertiveness if nothing else! Jemaa el Fna is the main square and congregation point in the centre of the old city. It’s big, and by day it’s relatively tranquil compared to the evening when everything comes alive. You probably won’t have experienced a square quite like this one before; there will be snake charmers, magicians, people playing instruments and all kinds of weird and wonderful entertainers. There will be others selling wares and local foods, but if that’s what you’re interested in, head there at night when the food stalls are in abundance. On the south side of the Kasbah Mosque you’ll find the Saadian tombs: opulent sepulchres (burial sites) from the era of Sultan Ahmad al-Mansur and the Saadian dynasty. Originally found in 1917 after having been hidden for years, they have since been renovated. The tombs are a major tourist attraction, so be sure to arrive early if you’re not into crowds. 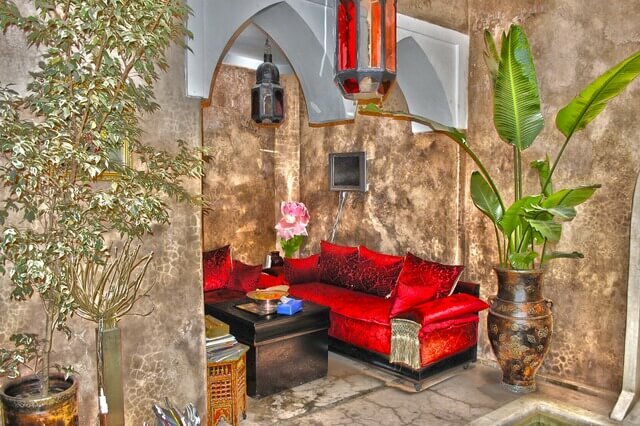 It won’t be long before you hear the word Riad, if you haven’t already booked to stay in one. These old Moroccan houses are prolific and often majestic in appearance, and now many are geared up for tourists. Lots of Riads now operate as hotels, but some are just restaurants, and others are locals’ homes. Most public Riads have a central courtyard that doubles up as a reception or dining area, and they’re both atmospheric and charming. Many also have a rooftop area, and if you book to stay one with a pool, you’ll be in for a treat. Other riads have gardens with a swimming pool, and while lounging by these it’s easy to forget you’re in the middle of a lively city. One glance at most riads will tell you why they’re fairly expensive, but if you can’t afford to stay in one, at least visit for a meal or two. You’ll find the Place de la Kissaria at the north end of the souks. This large open plaza is encircled by public buildings, and the architecture is fascinating. 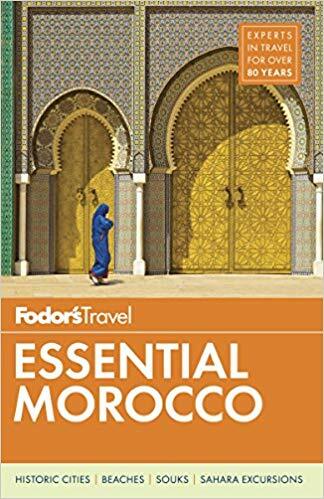 This is also the site of the stunning Ben Youssef Mosque (considered the oldest and most important mosque in Marrakesh), as well as the Marrakesh museum, which is also worth venturing into. Next to that you’ll find the Almoravid Koubba, which is a modest small two-storey building constructed below ground level. The interesting thing about this building is that it managed to survive the changes made during the eleventh-century Almoravid dynasty. This dynasty was behind the current style, the one we tend to see as typically Moroccan. Beyond the Medina, a green world awaits. The Jardin Majorelle is another popular tourist attraction; an artists studio and botanical gardens that offers a peaceful escape from the madness downtown. 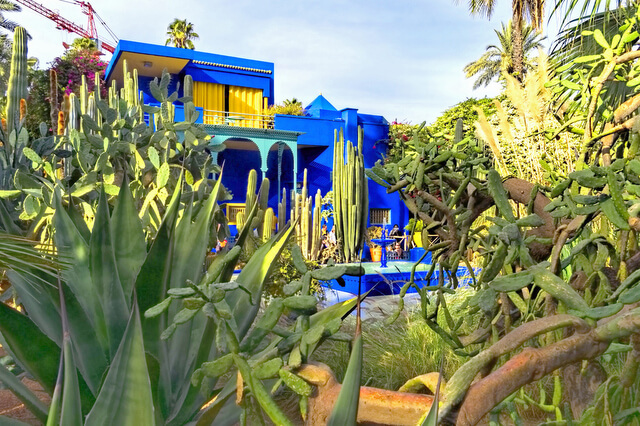 Originally created over a 40 year period back in 1886, French painter Jacques Majorelle put his all into this giant and glorious garden. Fashion designer Yves Saint Laurent purchased the villa in 1980 and restored the site to it’s former glory. Open to the public, while meandering through the two and a half acres of lush greenery, you’ll find ponds full of lilies and a whole host of cacti species, along with sculptures, fountains, and peaceful areas to relax. Most tourists welcome a few hours in this paradisiacal Moroccan garden. The villa also houses the Islamic Art Museum of Marrakech, the Berber Museum and has recently opened the Musee Yves Saint Laurent. 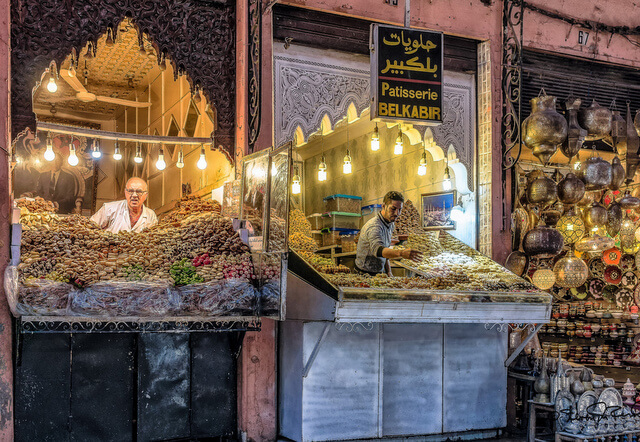 Street food is abundant in Morocco, but one of the best places to sample it is the Medina. 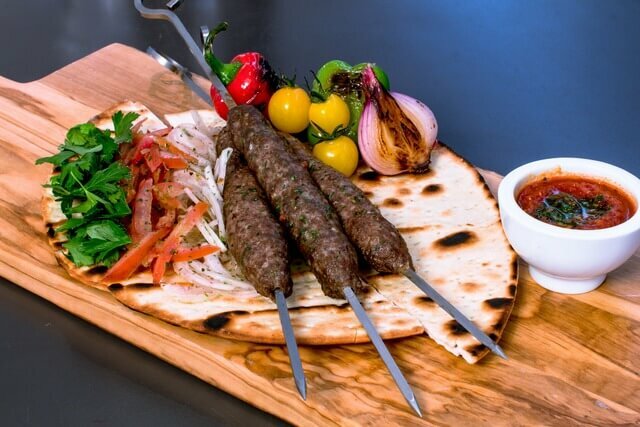 Here you’ll be able to taste Ma’akouda (potato patties), Msemmen (grilled meats), Sfinge and Kringo (donuts), and delicious soups by the name of Harira or B’ssara. If you’re thirsty, there are all kinds of exotic juices to quench your thirst. Though a word of warning on this one: watch out for vendors who aren’t taking care to clean their equipment; the last thing you need is your weekend being destroyed by food poisoning! It’s always a good sign if there are plenty of locals or families attending the stalls – those will be the most trustworthy vendors. The Dar Si Said mansion dates back to the nineteenth century and it’s really something to behold. Once a lavish palace, today it is much more. It has been converted into a museum, in which you can find captivating woodwork, ancient chests and luxurious carpets. There are also plenty of interesting costumes, but the one sight you won’t forget in a hurry is the plaster and carved cedar wood Hispano-Moorish ceilings, which are a real work of art. 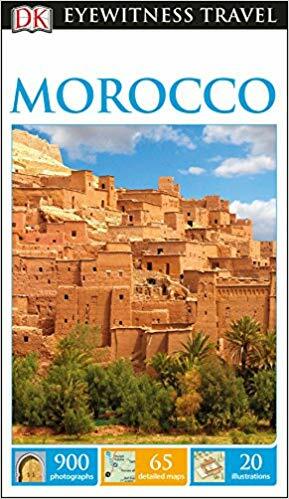 Enjoy your weekend in Marrakech, the city of intrigue, history, bustle and beauty. Remember to leave a bit of space in your suitcase for the fruits of your bartering! You might be surprised at just how many appealing goods are on offer – but memories are the best treasures, and you’ll surely be taking home a few of those. 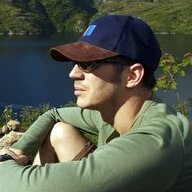 Sam Ross runs the blog The Hammock Hombre – a travel blog focused around the digital nomad lifestyle. Over the past 3 years, he has travelled to every continent, so writes on a broad range of countries, cities and destinations. What an enchanting place Meg. Been on our list for a minute. Great article Meg.Awesome place this is to explore. I wonder we can do much in just 48 hours. Thanks for sharing such content and beautiful images.